Resident DJ Adzmandala takes a trip around the potential sounds of the Cosmifrica dancefloor. 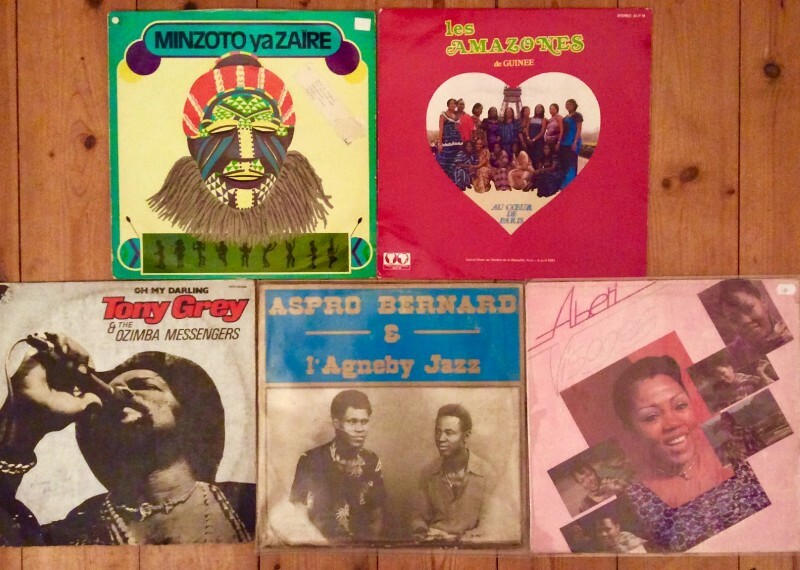 Selecting a top five of original African records that hopefully inspire, educate and move the crowd! Cosmifrica regularly takes place at Ernest; the next night is Saturday 4th November. I randomly pulled this LP out, from a small record fair at the Haggerston Pub in Hackney and I am so glad I did. The tune ‘Tchekele’ is a wild, tropical, funk workout with tribal chants and poly rhythms played at blistering speed. It’s a complete gem and never fails to get the dancefloor moving. Wow! What a track on this album recorded live in Paris ‎by this all female group (who were all part of the of the Guinea military before creating the band). A gentle introduction leads straight into hard, powerful afro funk and mesmerising vocals. This track from the LP was recently reissued on a 7” by the wonderful Mr Bongo record label and it is worth tracking down. Addictive stuff! It would not be Cosmifrica without some Nigerian Disco! The track here called ‘You are the one’ is perfect for warming up any dancefloor, chances are you will hear it at Cosmifrica early on and its best played loud! Tony Grey is a stalwart of the Nigerian music scene, loosely involved in the Nigerian psych rock era of the early 1970’s (perhaps that’s a story for another time). Here Tony Grey and his accomplished backing band deliver a lesson in drum machines, synth led boogie basslines and off kilter disco…essential! This obscure LP, is completely under the radar and it delivers; delirious, dancefloor soukous, which is then punctuated, without warning with some crazy synth, think along the lines of Nigeria’s mythical William Onyeabor as a reference. Completely hypnotic, unpredictable and invigorating! There are a number of great tracks on this sought after release by the legendary singer from the Congo, who sadly passed away too soon. The stand out track for me is ‘Motemi Pasi’ which is a great slice of mellow afro disco, complete with horns, flute riffs, moog and Abeti’s imploring vocals. Another of her tracks ‘Usisilike’, with its killer open drum break was featured on the great Beach Digging compilation by Heavenly sweetness France. These comps are well worth investigating for further African, Caribbean and Balearic leaning music. See you on the dancefloor.